Sue and Tandy Walker with Tandy's Class A Lanzo Bomber. As you know, when I got interested in building a Flying Aces Club (FAC) model, I decided on the small AT-6 after reading an article about the AT-6 FAC competition in Flying Models. I ordered the plans and a canopy from Richard Zapf and proceeded with the fuselage construction to the point shown below. It was then I started receiving several e-mails from a number of experienced FAC modelers suggesting that I had selected a somewhat difficult subject to make fly because (1) it was a low wing, (2) because it was relatively small with only a 21" wing span, and (3) it was going to be heavy with all of those stringers. The basic message that kept coming through was that I was doomed for flight failure with the AT-6 as my first FAC model. Therefore, I put the AT-6 project aside to be finished at some later time. A year or so earlier (before the AT-6) I was told by Ed DeLoach to contact Mike Midkiff to help me get started in FAC modeling and to help me select a suitable "first" FAC model to build. I did and Mike was more than willing to help. 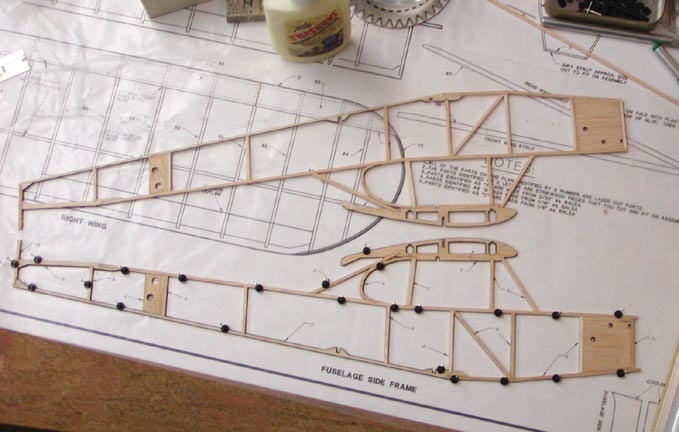 We met over at Roy's hobby shop in Hurst and he selected the Herr Piper J-3 Cub kit for me to build, which was a larger model with about a 36" wing span. Then we went over to Mike's house and went through the kit. He made several changes such as reducing the wing dihedral and raising the location of the rubber motor pin at the back of the fuselage to change thrust line. However, I was still working on my Class A T-Bird free flight at the time so I did not start the J-3 Cub project and that has now been a couple of years ago. 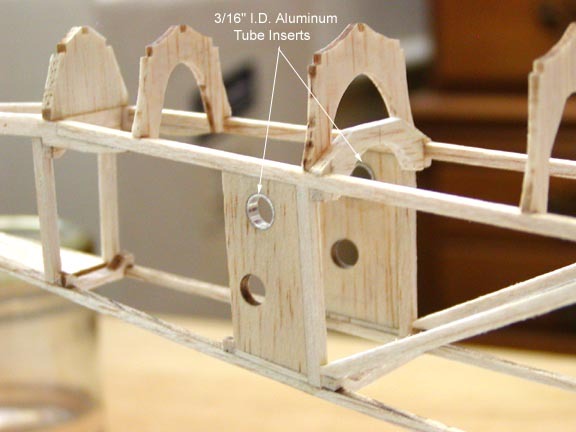 So Saturday afternoon I framed up the first fuselage side as shown below. 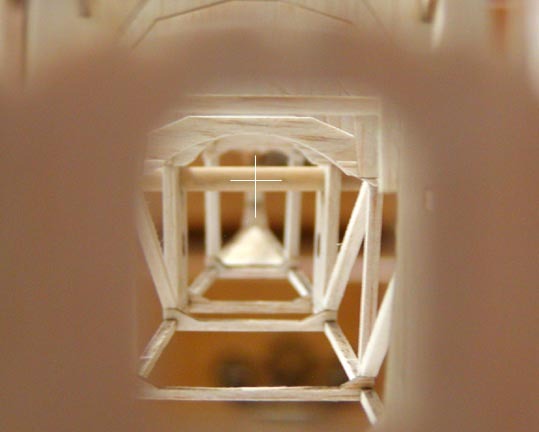 The laser cut parts for a scratch builder are a real treat. Then Sunday after church (and before the Cowboy game) I framed up the second side as shown below. Oh yes, notice the raised hole for the rubber motor aft pin that Mike Midkiff recommended. I have spent the better part of the day assembling the two sides, adding cross members, diagonals and bulkheads. The picture below shows an interim step in the progress with the two central bulkheads installed, a few aft cross members, and the two sides sanded and glued at the tail post. 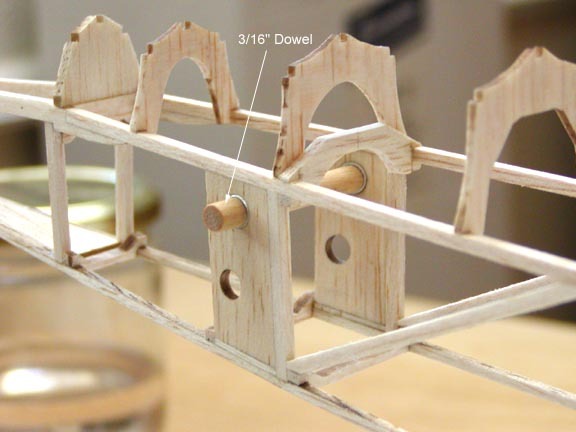 A proper length of 3/16" wooden dowel that serves as the rubber motor pin slides into the aluminum inserts snugly as shown below. This is later in the day with four side diagonals glued in and all of the bulkheads installed as shown below. I have removed excess wood from several of the bulkheads as suggested by Mike MidKiff back when we went through the kit. There was a construction set back today when it was discovered that all of the top longeron cross members were in the line of the rubber motor as a result of raising the rubber motor pin in the back of the fuselage. The 3/32" cross members had to be cut out and some new 3/32" arches were made to replace the two rear cross members. 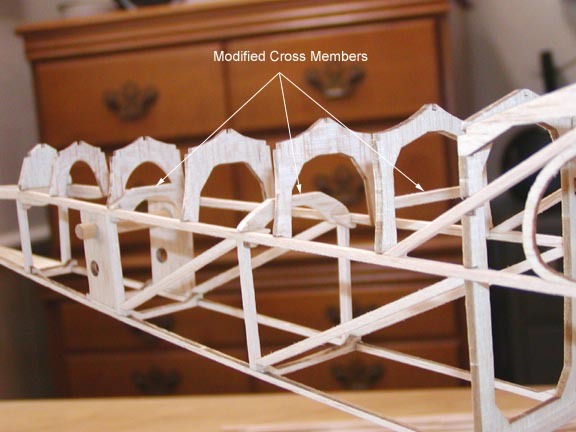 The most forward cross member was cut out and a piece of 3/32" square balsa was glued across the bulkhead up from the top longeron about a 1/2" as shown above. Re-Use by Modeling-related Web sites Authorized so long as credit to Society of Antique Modelers, SAM 27 appears on page where used. All other rights reserved, including publication. Society of Antique Modelers Chapters (SAM) may re-use images and text from this site so long as credit is published with the image or text and image used: "Used by permission of the Society of Antique Modelers, SAM 27". 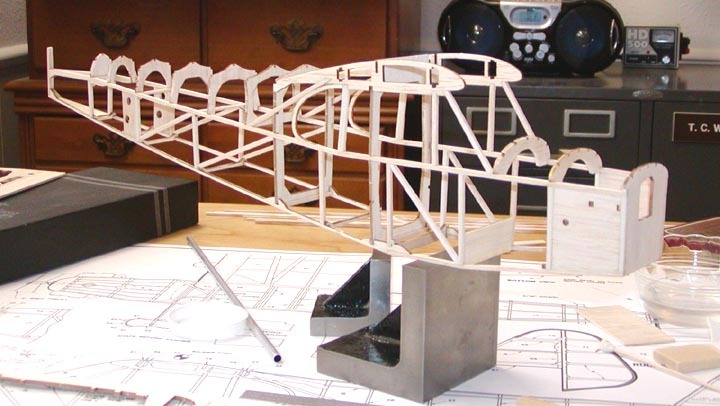 Members of the Academy of Model Aeronautics chapters (AMA) are granted similiar reprint rights. All other organizations may EMAIL the webmaster for permission to reuse material contained or used on this site.